Making your own sweets is fun and can sometimes be cheaper than buying in shops. Home-made sweets make lovely gifts too. There’s no end to the types of sweets you can make. Start with some easy recipes and work from there! 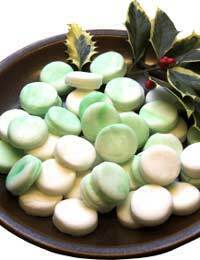 Peppermint creams are one of the easiest sweets to make and are also a fun project for kids. They can be decorated and cut into different shapes and sizes and you can even add different food colourings to create coloured creams. Step one: Lightly beat the egg whites, whilst gradually adding the icing sugar. Step two: You should end up with a firm, dough-like mixture. Step three: Mix in a few drops of peppermint flavour. Step four: Dust a work surface with icing sugar and roll the mixture out to the thickness you’d like the sweets to be. Step five: Using a small novelty-shaped cutter, or just a knife, cut individual sweets out. Step six: Leave the sweets for around half an hour to set on a baking tray covered with greaseproof paper. Coconut ice again requires no cooking so it’s great for kids. Coconut ice is also great for gifts or party favours. Step one: Put the condensed milk into a bowl and gently beat the icing sugar in. Step two: Mix in the desiccated coconut. It will be quite hard to mix so you may find it easier to use your hands. Step three: Spoon half the mixture into a greased cake tin to form a layer. Step four: Add the food colouring to the remaining half of the mixture. Step five: Add this to make the second layer. Step six: Allow to set for four to five hours in a cool place. Step seven: Cut the coconut ice into squares. Fudge is very popular. Once you’ve mastered the basic recipe, you can vary it with all sorts of things – rum and raisin, cherry and almond and even smarties, for example. Step one: Heat the milk, sugar and butter in a pan slowly until the sugar and butter has dissolved and melted. Step two: Bring the mixture to the boil, stirring continuously. Step three: Boil gently for 20 minutes. Step four: Use a thermometer to gage when the mixture reaches 115 degrees and then remove it from the heat and add the vanilla extract. Step five: After five minutes’ standing time beat the mixture until it starts to thicken. Step six: Pour the mixture into your greased tin and allow to set at room temperature (NOT in the fridge). Step seven: Once it has set, cut the fudge into squares and store in a sealed container.